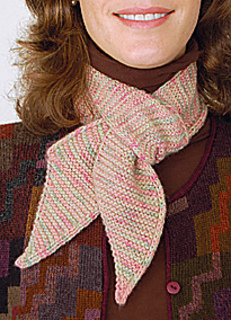 This VERY EASY reversible scarf, with 3-stitch rolled edges and diagonal ends, has no wrong side. It is a great project for beginner knitters who can knit and purl. Knit it in silk, bamboo or cotton for spring and summer and cashmere, alpaca or merino for fall and winter months. Choose one or two balls of your favorite sock or lightweight sport yarn and make a scarf any length you like – then wrap, knot or tie it any way you want!